"After finishing my dual bachelor's degree in business administration, I realised that a master's degree would be helpful to enter the world of investment banking. This is the reason why I decided in favour of M.Sc. 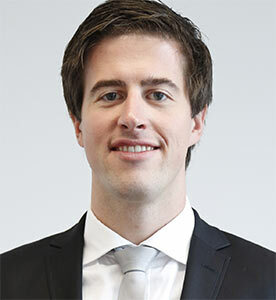 Finance at ISM," says Michael Johner, M.Sc. Finance graduate, about his choice. "Besides the focus on the financial sector, the opportunity to gain an international double degree at one of ISM's renowned partner universities abroad definitely swayed my decision." After completing a work placement and gaining valuable practical experience at Commerzbank and the European financial advisory firm Leonardo & Co., Michael went on to do a double degree at Lancaster University in the UK. In addition to the M.Sc. in Finance at ISM, he also graduated with a M.Sc. in Accounting and Financial Management. Directly following this, he started his career as an analyst at Leonardo & Co. in Frankfurt/Main. "Entry was facilitated by the fact that I had already been involved in many of the work processes during my internship and I was familiar with a number of procedures from case studies presented during lectures at ISM. I immediately felt like a fully fledged member of the team."